Faraway Press: The Online Home of John Jackson Miller: Mysteries revealed! Knights of the Old Republic War #3 hits stands! Mysteries revealed! 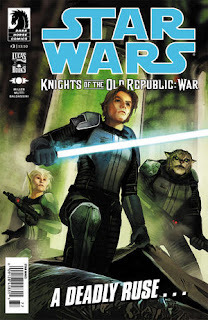 Knights of the Old Republic War #3 hits stands! Just when things are looking bleak for Zayne Carrick — things get worse! That's been the story of his life. But that twinkle in his eye is never far away, as we see when Star Wars: Knights of the Old Republic - War #3 hits the shelves on Wednesday. Former Jedi councilor Dorjander Kace has been playing a mysterious game, using the same kinds of ruses Zayne specializes in. But he's up against the real master, now — and when Zayne figures out what Kace is up to, he has to think even bigger! The issue is available from your local retailer and from Things From Another World. Check it out — I'll be along in a few days with some thoughts on the issue. And don't forget that I'll be at Midsouthcon in Memphis from March 23-25, along with Crimson Dynamo artist Joe Corroney and author Michael Stackpole!